Effective relief of neck & shoulder aches, muscle aches and stiffness. Multiple massage modes and intensity levels. Snug body-hugging design for a comfortable and targeted massage. Pre-programmed auto-rhythmic massage and Portable hands-free design. One-touch control panel; Built-in auto timer of 15 minutes. Are you tired out every day with office jobs? Have you got pain on neck and shoulder after all day facing the computer? 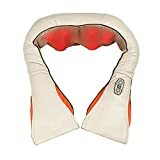 If yes, this Neck & Shoulder massager provides an invigorating massage to relive the pain on your neck, shoulders, back, lumbar, leg and buttock. Everywhere of your upper and lower body can be massaged. Compact design, you can use it anywhere at home, Use after while watching TV, or after sport or when you experience muscle pain from Sport or sleeping Pain. office or while traveling!